French Friday: Cette une miniature GT39.4! Inspired by the win of Ford’s GT40 at Le Mans it was Jacques Durand who came up with a small mid-engined car in 1969: The Jidé. And if you ask how that inspiration of the GT40 revealed it self: check that front! And that wasn’t all. It’s height is with 1 meter high pretty close to the GT40's. As 1 meter is 39.4". That, and the mid-engined layout, was about it though. Tiny engines compared to those Ford V8's and I’m sure the GT40 weighed more than the Jidé’s 640 kg curb weight. Jacques Durant worked for several automotive companies before he started Jidé. One of those companies you might know: Chappe et Gessalin. Or CG. I mentioned that company before in my CG13oo post a while back. And CG was one of the few companies Jacques had not worked with Renault engines, for his own creation it was only logical he turned to Renault/Gordini though as he had a lot of experience around those. Just like the competitor he was aiming at: the Alpine A110. He even used parts from Alpine, do you recognize those taillights? But wasn’t the Alpine A110 more about rally? Quite right: that’s where the Jidé excelled as well. Winning the Rally de Poitou in 1972. In front of a Porsche 911S. 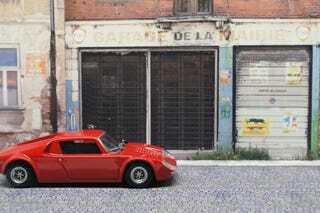 And several... Alpines A110. Behind the wheel another French legend tied to Renault somehow: Jean Ragnotti. Due to lack of capacity to back up rally teams it was mainly privately owned Jidés that competed though. No Championships, just local successes. The Renault engines came from several cars: R8, R8S, R8 Gordini, R12 and R16. Ranging from 1100, 1300 to 1600cc. And from nearly 50 to easily over 100 hp. In it’s later resurrections even the Renault 20 2000cc 4-cylinder was fitted. And Michel Baxas tried mounting a Porsche flat six from a 911 when he tried to create a track tool. But what’s with the “resurrections”. Well, in 5 years time, in 1974, the Durand ownership already had ended as he sold it to Michel Baxas. That was no success. Three years later though, in 1977, the Société des Automobiles Jidé was started and built a few new ones. Then somewhat later, in 1978, production was moved to the Club Jidé France. But I doubt many suitcases can be stored in any of these anyway, nor will many 1:1's be the same. What I never did see was a Jidé with a that forward positioned rear view mirror like the Altaya has, I’m pretty sure the A-pillar prevents the driver to see anything in that! Most important feature on casts of a proper sports car like this one though are spinning wheels: check. Then there’s only one item to cover: It’s name. Jidé. Actually not that hard to get: Jacques Durand’s initials. J and D. Pronounced in French. C’est ca! J’espère avoir surpris quelques-uns d’entre vous. Because it’s not all that well known I suppose. And last week was pretty slow when it comes to French Friday so I definitely hope to see more today! Bon Week-End!! !